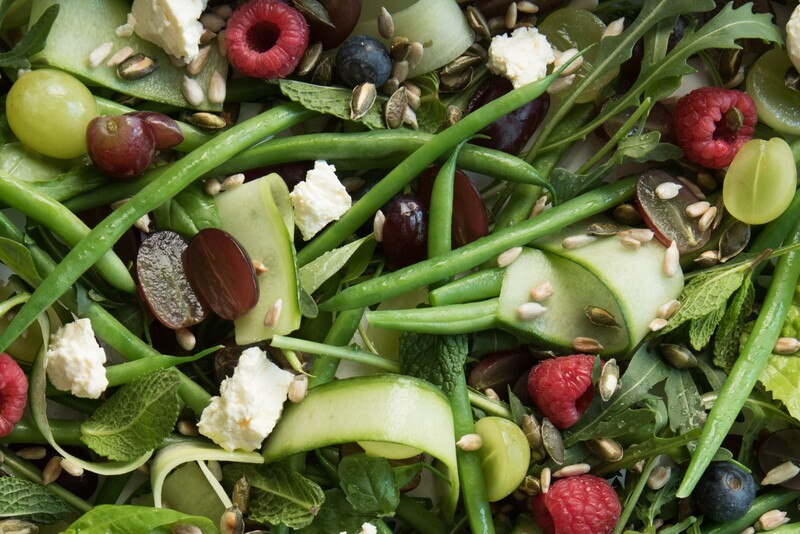 The secret to a scrumptious salad is to keep things simple, so don’t combine too many ingredients in one bowl. A homemade salad dressing to complement the fresh ingredients adds more zest to a salad than just another element. And who says a salad has to be made in a bowl? A platter, wooden board or any interesting dish can be used. The more you can show-off the ingredients, the more appetising it is. Remember, we eat with our eyes first, so if it looks good, it tastes good as well. 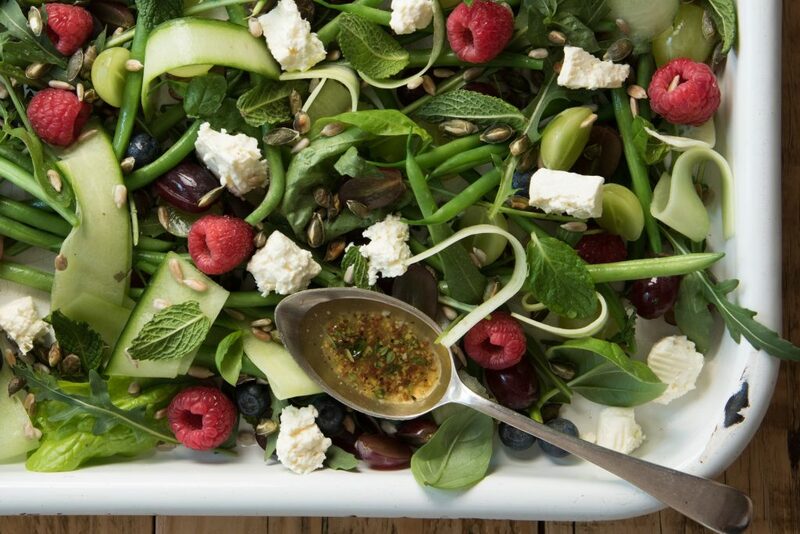 This combination of lettuce and fresh herbs with green beans, cucumber and colourful fruit that is in season is sure to be a show stopper at your next braai or gathering with family and friends. 1. Salad dressing: Mix all the ingredients together and season to taste. 2. Salad: Heat a frying pan over a medium heat and toast seeds without any oil until golden brown, taking care not to burn them. Spoon out and allow to cool. 3. Place the green beans in a shallow dish. Pour boiling water over them and allow to stand for 5-7 minutes or until just cooked. Drain and rinse with cold water. Alternatively, lightly cook in a little water, but they must remain crunchy and bright green. 4. Halve some of the grapes and seed if necessary and keep the rest whole. 5. Arrange grapes and green beans with the rest of the salad ingredients on a large salad platter. Sprinkle with nuts and feta and serve with the salad dressing. 1. Any other seasonal fruit will be delicious in this salad. Try peaches or nectarines, cut into wedges, strawberries, halved or mango, cut into cubes. A combination of different fruits works well. 2. In the colder months of the year use citrus fruit, avocado and papaya.